The Centre de Cultura Contemporània de Barcelona (CCCB) organises and produces exhibitions, panel discussions, festivals and concerts. There are films, courses in different themes can be visited and readings are held. You will find the CCCB directly in the Raval district in the city, only a few metres from the Rambla and the MACBA. The CCCB supports artists by providing them with facilities to manage their works of art to other galleries and museums borrow. It is also open to freelance artists. Because of this openness the CCCB can offer a high-quality, interdisciplinary program. The Centre de Cultura Contemporània de Barcelona does not have its own significant permanent exhibition, but the format and the program is subject to constant change. We recommend, before a visit to become informed on the content of the current exhibition and events. 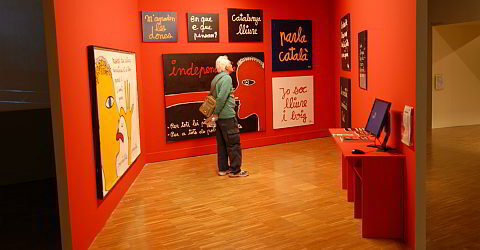 The program of exhibitions can be found on the website of the CCCB. The Centre de Cultura Contemporània de Barcelona is a public institution, which is owned by the provincial government and the city government. For a break you will find a very nice cafeteria. Closed on Mon. (except on holidays), 25 Dec. and 1 Jan. Restricted opening times: 24, 26, 31 Dec., 5 and 6 Jan.
Free admission for children under 12 yrs. Free admission on 12 Febr., 18 May and 24 Sept. The visit should be about 1-2 hours.